About a month ago before my oldest daughter went off to kindergarten I had some moments of panic, not necessarily because of the curriculum she’d be learning about, the friends she would make, or even the fact that she would be gone all day...I was most stressed about her school lunch that I would be packing for her. Being gluten-free, vegan and as green as I can be, the thought of traditional lunches brought from home with their baggies, plastic containers, and not-so-healthy food choices made me worry and wonder...how can I do it? Can I pack a healthy, vegan, lunch for her in an eco-friendly way? 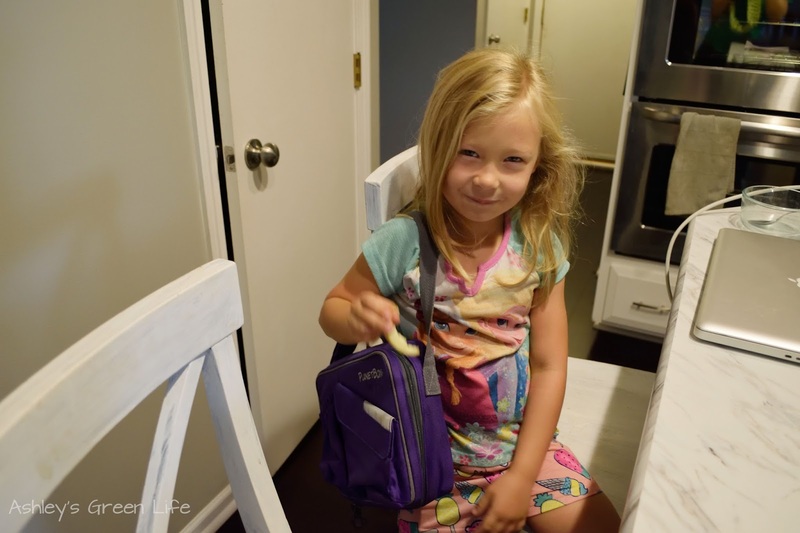 In the years prior when she had attended preschool, I was used to packing a snack for her which had a simple formula: fruit and gluten-free snack (crackers, pretzels, veggie chips, etc.). 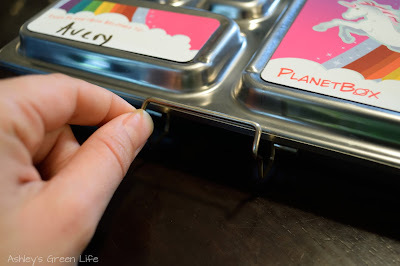 I used a simple stainless steel snack container that was divided into two sections, which was easy enough. But the thought of a packing whole lunch that she would be eating on her own (without me to open the containers, warm it for her and make sure she ate all her veggies!) left my head spinning. 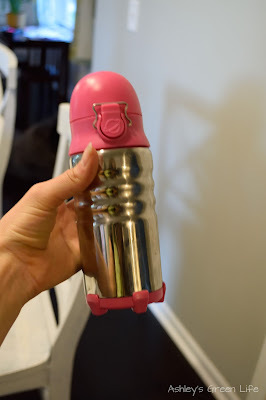 So as I do with any new life change that’s stressing me out, I started researching what kind of containers or lunch box could I use that could be both eco-friendly and easy for her to use. I didn’t want her fumbling through 10 little mini containers but I also didn’t want her using Ziploc bags, which I rarely if ever use because I can’t bear the thought of just throwing them away after just one use. It wasn’t long into my search that I kept finding the same product again and again, a PlanetBox. 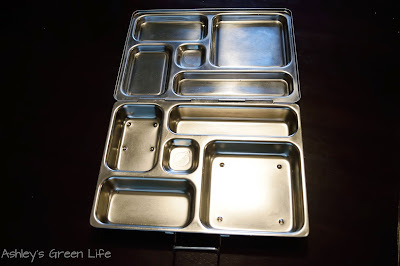 These are cool stainless steel lunch box trays with sections that can keep food from touching. 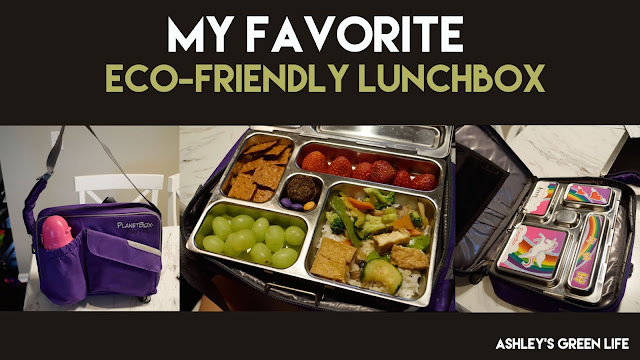 Even better the lunch boxes and be paired with a lunch bag which the lunch box fits inside just like a laptop, a waterbottle, and even fun little magnets to decorate the lunchbox. After showing it to Avery and we both fell in love. From there I reached out to the company and they sent me one to try, and since then I am hooked...and I’m not even the one who uses the lunch box! The specific PlanetBox lunchbox I use is called: Rover which contains 5 sections within the lunchbox, as you can see one big section, medium sized sections and one little section (which we’ve deemed the “dessert section!”). 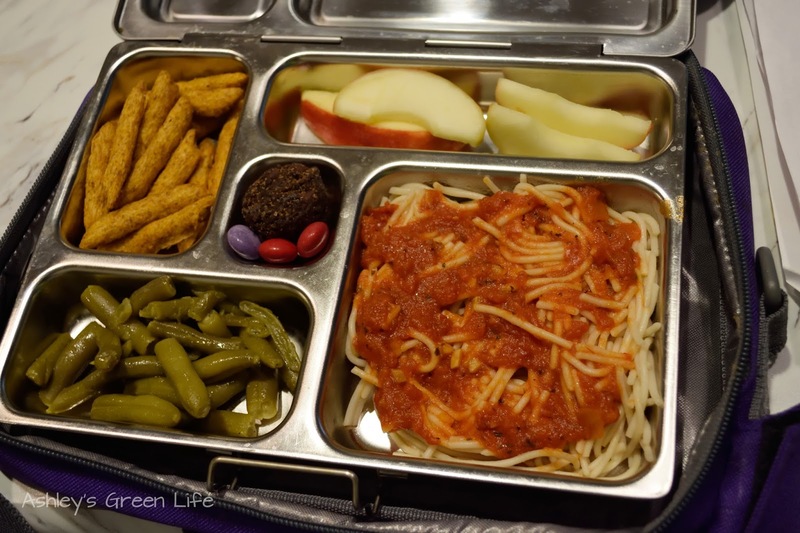 The lid to the lunchbox is always attached as well, which comes in handy for busy and sometimes forgetful kindergarteners! We also got the “Power Purple” Carry Bag for the lunch box to go in for easy carrying to and from her classroom to the cafeteria and then back home again. And we got a “Perfectly Pink” Bottle Rocket Water Bottle. 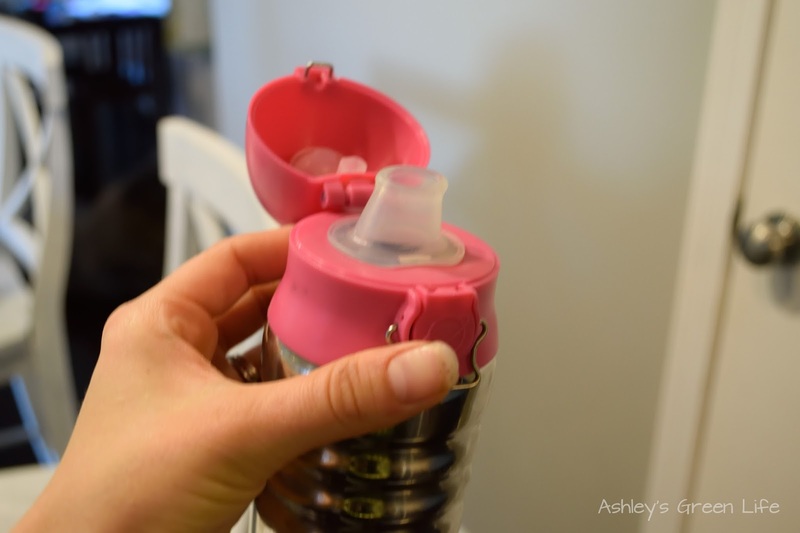 These may just be my favorite eco-friendly water bottles to date. We haven't had any trouble with leaking or spilling! And to be the icing on the cake, Avery picked out the “Rainbow” Magnet Design set. In case you’re wondering, the Rover Planet Box on it’s own costs about $55. Add in the carrying bag, and water bottle (which are discounted if you combine it all in your order) it’s about $87. Which I agree can be quite a shock to purchase, but considering the money I’ll save by having Avery bring her lunch instead of buying it all school year helps justify the cost already. 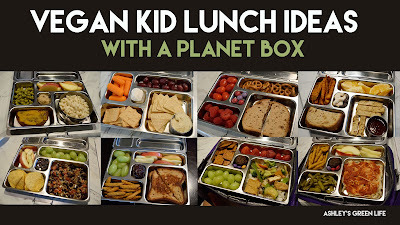 But on top of that the PlanetBox also has a 5 year warranty so if you can imagine all the the other containers, baggies, and lunchboxes you would buy in the span of 5 years if you used other lunch box/snack materials, I’d guess $87 is not too bad. On top of that, the price is worth it for all the great features it has. My favorite is the fact that I can include 5 types of food in perfect portion sizes all in one compact lunchbox. 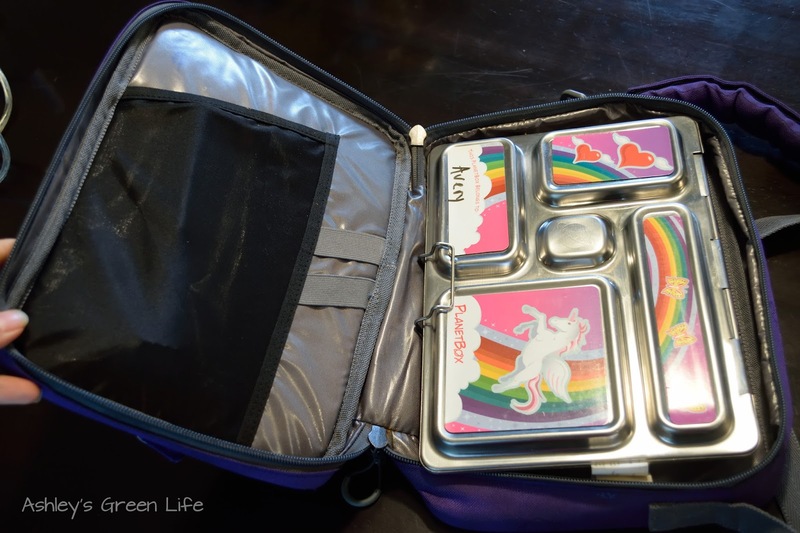 This helps to ensure I pack fruits, veggies, plant sources of protein, whole grain snacks, and a little sweet treat all together for Avery. Not the simple PB&J with ziploc bag of chips I remember throwing together on my own as a kid. I also love that she’s learning that a meal needs a little balance to it. A little veggie, some fruit, my main meal, and something small for dessert. That’s how a lunch should be. It’s funny now because if I try making her lunch from home with just one or two things she says, “Wait!” where’s a fruit we can have or do we have a veggie with this. And you can bet I always have to include that little dessert at the end!Any other time I would try to pack that quantity and variety of foods with the traditional green containers I’ve used before usually equals one heavy load, and that’s just for lunch. So that fact that such a variety of foods can be packed together easily and eaten with ease (not having to rely on a 5 year old to open each container and keep track of all the lids) is such a relief. 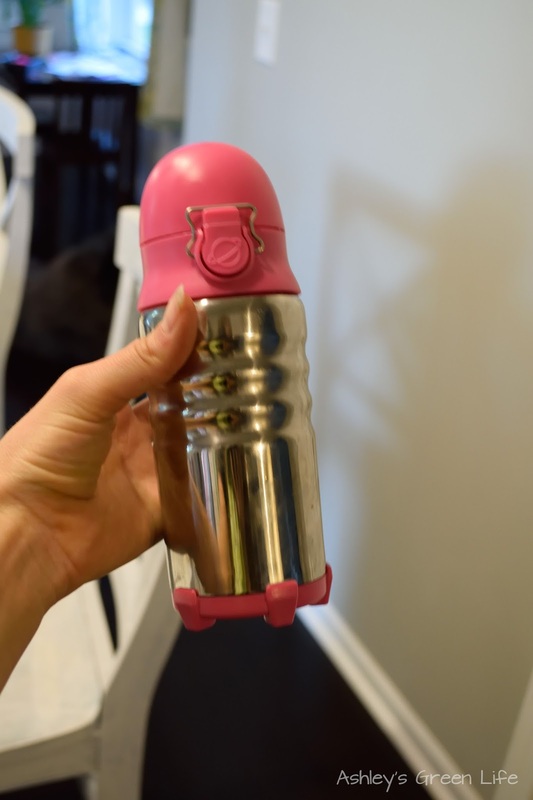 Beyond that I also love that it’s certified non-toxic, BPA-free, and free from lead and phthalates too. Even better, no trash is created with her lunch. I love that packing this lunch for her each day doesn’t contribute to trash and bags being thrown into the landfill, that seem so simple when you just look at it day to day, but add that up once a day, each day of the school year, and each year of the child’s education and you end up with a pretty big mound of trash, but it doesn’t have to be that way. Read more here. One last secret perk of the PlanetBoxes is that they are just plain fun both for the parent and the kid. 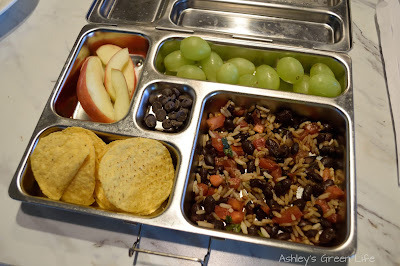 As our routine works now, Brandon and I often end up making her lunch for her the night before or in the morning before school, after getting ideas from her what sounds good for us to include. We both just kind of love the way the food looks, all cute and colorful in it’s little containers. It’s kind of like wrapping presents for your kids on Christmas Eve. We think, “Oh what if we include this? Oh she’d love it if we ______!” Then each morning after Avery wakes up I usually show it to her to get her approval or make last minutes swaps. The look on her face sometimes is truly like Christmas morning, “Wow, those grapes look so cute. Or “Oh crackers plus Dad’s famous grilled cheese...yes!”. Okay maybe we’re just food-prepping nerds, that love a good homemade lunch but either way, it’s made our food prepping time much more fun than I planned. She always has to taste test it in the morning! I suspect that as Avery gets older she will be much more involved in the making of her lunches each day, but for the time being, we’re doing good to get dressed and eat breakfast before heading out the door, so I’ll tackle that one another time (hence the reason why I have her help me start getting it ready the night before). 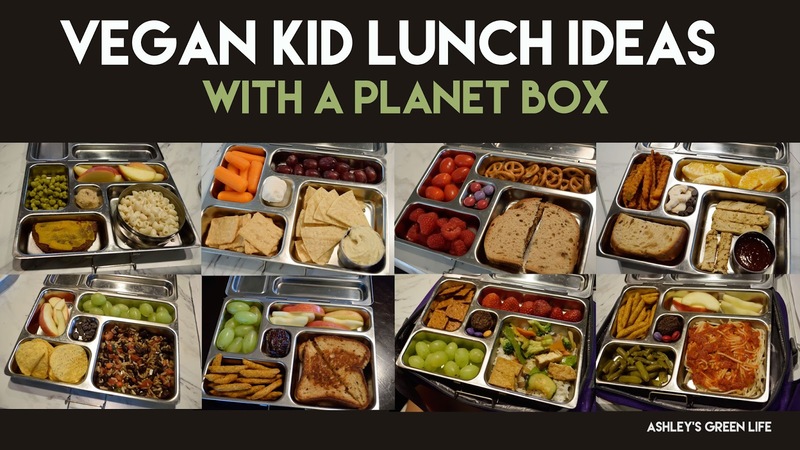 So there you have it, our new favorite eco-friendly lunchbox: The infamous PlanetBox. 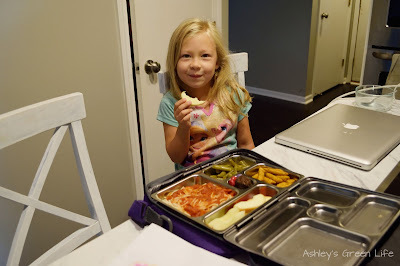 Truly it lived up to and exceeded all my expectations for the perfect lunchbox for my daughter and I can’t wait to get some more for the rest of my family. What’s your favorite lunchbox? Have you tried the PlanetBox? Share your thoughts and ideas below. 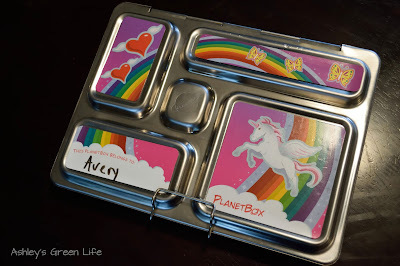 And stay tuned for my next post where Avery and I share our favorite vegan lunch ideas using the PlanetBox! 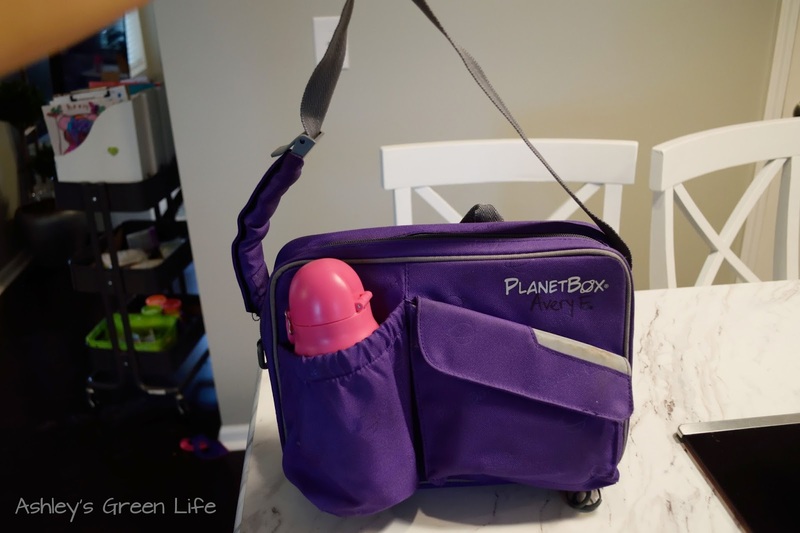 Disclaimer: PlanetBox sent me this lunchbox for free in exchange my for my review of it. The opinions are expressed are my own. How I Transformed My Kitchen Cabinets for Under $100! © 2016 Ashley's Green Life. All rights reserved. Powered by Blogger.